For me Il Trittico is virtually a new opera. If my memory serves, I have seen only Gianni Schicchi in the opera house, though I have videos of Il Tabarro with Domingo and Gianni Schicchi with Florez. (I've written about this before here.) This is my first time for Suor Angelica. Obviously, I have been today to see the simulcast from the Metropolitan Opera of Puccini's Il Trittico, this time in Dayton Ohio, my fourth city. We were told in the intermission that this is the Met's most complicated production. The second most complicated is the current Turandot. There was a lot of hammering in the intermissions. The opera gets gigantic sets in the naturalistic style. We are at the Met, you know. This opera is also known as the Stephanie Blythe show. In Il Tabarro she was Frugola who brings Giorgetta small items to please her. In Suor Angelica she played La Principessa, magnificently. My feeling was that whether or not Suor Angelica is a functioning, moving, tragic opera depends completely on how this character is played. She had a fabulous aura of the dominating, unforgiving aunt, the person who never forgives. Suor Angelica sends her to hell without an apparent afterthought. She tells Angelica that her son died two years ago, the only news she cares to hear. La Principessa is utterly pitiless. Stephanie Blythe's third part is Zita, Ranuccio's mother in Gianni Schicchi. There is great wisdom in the current Peter Gelb administration. Making opera work dramatically is the best thing that can possibly happen to it. Second is transmitting it to movie theaters so we can spare the overwhelming expense of attending opera. Now that I have become a person on a fixed income, I appreciate these things a lot more. I liked very much the casting of Il Tabarro. Maria Guleghina as Giorgetta, the straying wife, Juan Pons as Michele, her husband, and Salvatore Licitra as Luigi, her boyfriend, felt like a cast that very much blended with one another. Licitra sang well and did a great dead guy, holding his eyes open for a really long time. I worry about him. I feel he doesn't support well enough and often oversings. Yes, I know that's the same thing. Juan Pons is always marvelous. James Levine was interviewed in the intermission and commented on the popularity here of Suor Angelica, an opera with a terrible reputation. I would guess that it would work or it wouldn't. Here it worked. The music is beautiful, and Barbara Frittoli as Angelica was intense and believable. There was a very pretty deus ex machina at the end where a small boy, her son we will suppose, appears to her representing forgiveness by the Virgin. She realizes too late that by killing herself she has committed a mortal sin and will not get to see her son in heaven. The three operas are easily called Inferno, Purgatorio and Paradiso. Alessandro Corbelli played Schicchi very athletically for a dying man. It was terse and amusing. At the end the two lovers appeared in a garden overlooking Florence, and we were treated to the view from Piazzale Michaelangelo. Wonderful. This is interesting. It is a pianist's perspective. I think someone should just march out with the score, sit down, put it on the stand and start playing. I wrote about this once, less interestingly. I will annotate and rank this pathetic list. No wonder my brain is melting down. Rankings are on two levels: greatness and whether or not I actually listen to it. For greatness Lorraine Hunt Lieberson Neruda Songs has to be number one. For depth, for beauty, for emotion, for tone, and I’m sure a lot more things. For whether or not I listen, I confess Anne Sophie von Otter Speak Low really grabs me. For one thing there is this great photo on the cover with all that eye shadow and cynicism. It lacks a cigarette and drink, though. See Greta Garbo in Anna Christie to get the right way to play this. In fact Anne Sophie could take on Greta as a role model. She could use a little more mystery. Our Swedish mezzo gets completely into songs that are not in her native language. Are you listening, Americans? The latest thing on Weill is that Lotte Lenya says there is no German Weill and American Weill. There is just Weill. How can I argue? Why would I argue? Of all the Weill I have heard since I started blogging, Bebe probably got it best. Only her voice failed her. Both Alison Krauss and Norah Jones have done better. I very much prefer the Live album for Alison Krauss. Too many dead people on this one for me. Rolando Villazon Combattimento may just be a great recording. It’s hard to imagine improving on this performance of Monteverdi. I do indeed listen to Anna Netrebko Russian Album regularly, much more than anything else on this list. It wears well. The Rachmaninov is all completely exquisite. I continue to wish she would do a Rachmaninov songs album for us, but this is probably not the direction she wants to take. Rimsky and Tchaikovsky are also lovely. I am beginning to feel a longing for things Russian. Beatles Love feels stale and overworked. There’s nothing wrong with Rolando Villazon Gitano, but I doubt I’ll ever get really into zarzuela. Why isn’t Vivica Genaux rich and famous? She does not rise to the level of frighteningly awesome that La Bartoli manages, but she’s pretty damn good. Vivica Genaux Arias for Farinelli is highly recommended. She could loosen up a little, look longer and deeper for the feeling of each piece. Everyone could, for that matter. I like Ives. I have no other excuse. Maybe I should get a job in a music store like Sarah. Or is there such a thing in America? Why this fascination with Kurt Weill? Here Lies Jenny, Mahagonny, Street Scene, and this CD from 1994. Weill lies on the border between classical and pop, opera and musical, European and American, serious and trivial. Understanding Weill means understanding the role of style in interpreting any work. Curious things to notice include the fact that he collaborated with Bertolt Brecht for only about three years. It seems like a vast expanse, but includes only Dreigroschenoper, Mahagonny and something called “Die Sieben Todsuenden” or Seven Deadly Sins, recorded here by Anne Sofie von Otter. If there are 100 more things Weill and Brecht did together, look them up in Wikipedia. I must say I like von Otter here as I have not before. Both her German and her English are excellent. Remember she’s Swedish. Coolness in the face of decadence may be just what we were looking for. She has style to burn. Brecht turned on Weill, thought him guilty of seeking mere capitalistic success. Weill wanted to get ahead. Imagine that. What was Brecht’s problem? In the "Seven Deadly Sins" two sisters named Anna I who sings and Anna II who dances leave their home in Louisiana and travel to Los Angeles, Baltimore, Philadelphia, Boston and San Francisco seeking success. Brecht seems to have been fascinated by places in America—remember Mahagonny was in Alabama. We are synonymous with capitalism for him. The moral is disturbing: “Eat not and drink not and don’t be lazy, think of the punishment which is the cost of love! Don’t waste youth, for it passes quickly.” Could Brecht be your ordinary moralist? Fundamentalism without God? He loves to push your nose into the trashy and immoral to show you how bad you’ve got it. The problem is we adore this low life “Speak Low” trash in the voice of Kurt Weill. I think the moral isn’t working. 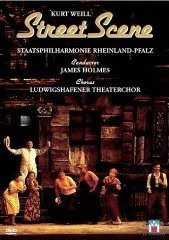 Street Scene, an American opera on a play by Elmer Rice, music by Kurt Weill, lyrics by Langston Hughes, produced by the Houston Grand Opera and theaters in Berlin and Ludwigshafen, 1995. And a large supporting cast. Mahagonny is about capitalism, how it starts, how it grows, how it corrupts, how it ossifies into exploitation, how it dies. Street Scene is about love. Is it any wonder it is considered Weill’s masterpiece? I suppose the street that makes up the set might look different ways, but the one on this DVD from Netflix looks exactly like a tenement in New York City in the 1930’s, exactly the way it should look. The entire story takes place during a heat wave. During the opera a baby is born, people are hot and sing about ice cream, they fall in love, they have affairs, they get drunk, they fight and they die, just like people everywhere. The singing is big voiced and operatic, but the show is easier to make work than Mahagonny where the philosophy overwhelms the characters. In Street Scene there are no hit tunes, but there is love. I believed it. I'm not sure I have seen the perfect Weill yet. Combattimento di Tancredi e Clorinda by Monteverdi is something you hear about more than you hear. It's from Book VIII of Monteverdi's Madrigali, but it is hardly what you would call a madrigal. It is a small play set in the stile rappresentativo of the camarata's invention. Tancredi dressed in armor meets his beloved Clorinda, dressed in Saracen armor, and proceeds to kill her. The words are from Tasso's Gerusalemme Liberata, the great epic poem from Monteverdi's youth. Is there anything to this new Baroque style? Can a singer really be expected to bring the same emotion into a narrative that would be achieved by a great actor? If that singer is Rolando Villazon, the answer is yes. If we are searching for a role model for expression, we need look no further than Rolando. His performance of this piece verges on the miraculous. I admit, I have often been puzzled by the attraction of Monteverdi. No more. The wonderful ornaments need an enthusiastic interpreter to come alive. Highly recommended. I went Saturday afternoon to see Flavio at Pocket Opera in the Palace of the Legion of Honor in San Francisco. I have been going to see Pocket Opera for 30 years and both Donald Pippin and myself are looking a little long in the tooth. Pocket Opera does two types of performances: Handel operas in Italian and all other operas in Donald's unique style of English translation. Flavio is in the first category. Both types of opera performances include Donald's droll commentary between the numbers. In the Handel operas this entirely replaces the recitative and includes a complete description of the action. Wikipedia contains this interesting Factoid: "The opera was first given at the King's Theatre in London on 14 May 1723 and revived on 18 April 1732. There were no further revivals until it was rediscovered and performed in Göttingen on 2 July 1969." Aha! There is a lot of useful information in this list. The male alto roles transferred to women were originally sung by alto castrati, Guido by no less a figure than Senesino. The male soprano role of Victor was however originally sung by a female soprano. Very interesting. This verifies Rene Jacobs contention that castrati didn't normally rise to the soprano Fach. Elspeth Franks, who appeared fully in drag, wasn't up to the demands of a role created for Senesino. She seemed to understand the music she was singing better than the other performers, but was simply not vocally strong enough for the part. Geeta Novotny, a gorgeous woman with a beautiful, warm tone and only occasional glancing blows at good phrasing. Perhaps she would be more interesting as Carmen. Erina Newkirk, a soprano with her own personal style, gave the strongest overall performance. Personal style is always good, though it occasionally resulted in some intonation problems. Kindra Sharich was entertaining and lyrical in the role of Thea, a flirtatious air head if I ever saw one. 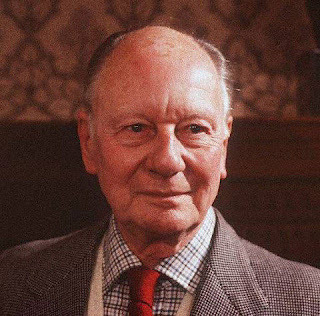 Brian Thorsett, tenor, was wasted in the Hugo role. Maybe he will get something bigger to sing next time. Donald is not progressing with modern tastes in ornamentation of Handel. I hear upward extensions in the da capo sections but no sudden irrelevant outbursts of fioratura, as is increasingly the case around the world.